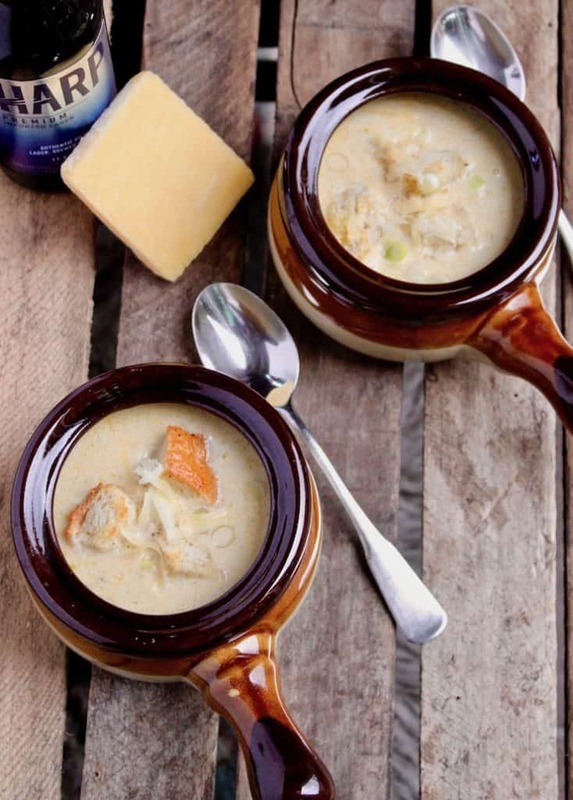 Irish Beer Cheese Soup ~ Irish beer and Irish sharp cheddar cheese come together in this delicious creamy cold-weather soup and St. Patrick’s Day favorite! 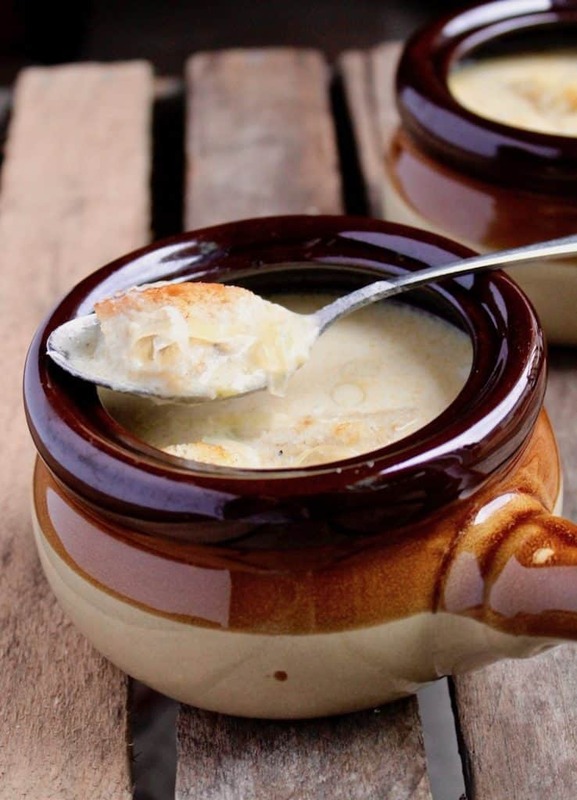 Irish Beer Cheese Soup ~ if you’ve never had, you’re in for a treat. 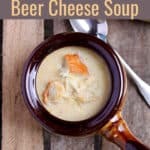 I recently had some cheddar beer soup from my grocery and man, was it good. With St. Pat’s Day coming up and all things Irish in the air, I decided to tweak that midwestern version by using some Irish beer and Irish cheese. This is a fairly simple and straightforward soup to make at home. The hardest part for me was grating all the cheese by hand, not my thing. I usually ask Meathead to do it but he wasn’t home, darn. The soup starts with sautéing some onion, celery and garlic, some seasoning, and then butter and flour. Basically, it’s a very flavorful roux. The onions, celery and garlic need to be very finely diced, so I recommend using the food processor. It does the job, it’ll look a little mushy, but that’s what you want so the soup is smooth, no bits of onion and celery floating around in it. I do this all the time for Italian gravy, my friend taught me so years ago. Once the roux is done, time to add the chicken stock, beer and milk ~ then all that glorious cheese. 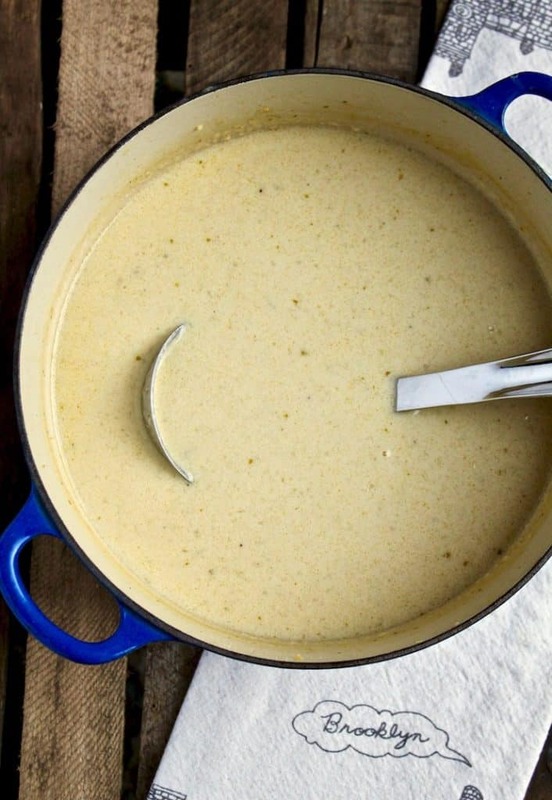 Stir, keep stirring, and in about 20 minutes you’ll have beer cheese soup. Finish it off with some Dijon mustard and Worcestershire, and then be prepared to ooh and aah over that first spoonful. Looking for more St. Patrick’s Day inspiration? How about some Irish Soda Bread, Corned Beef and Cabbage and Chocolate Mint Cake? You can’t go wrong with that lineup! 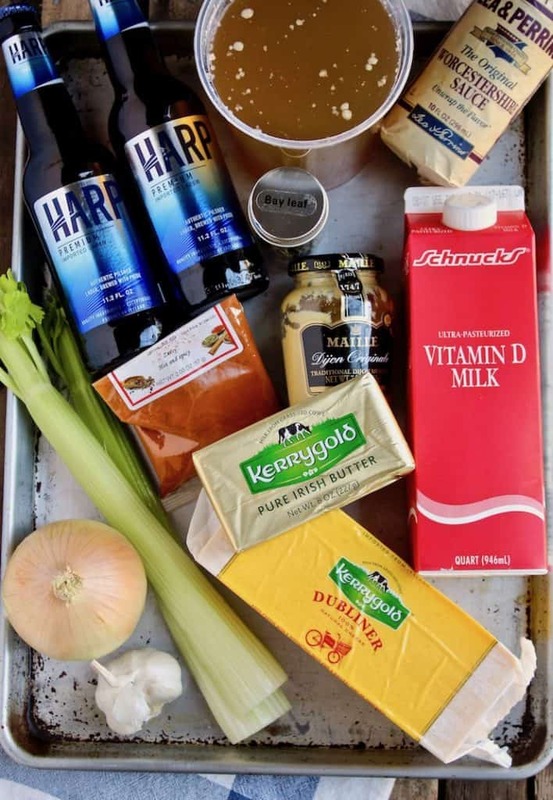 If you’ve tried this Irish Beer Cheese Soup, please rate it below in the comments and let me know how it went ~ I love hearing from you! HUNGRY FOR MORE? Subscribe to my Newsletter and come hang out with me on PINTEREST, INSTAGRAM and FACEBOOK for all the latest updates. 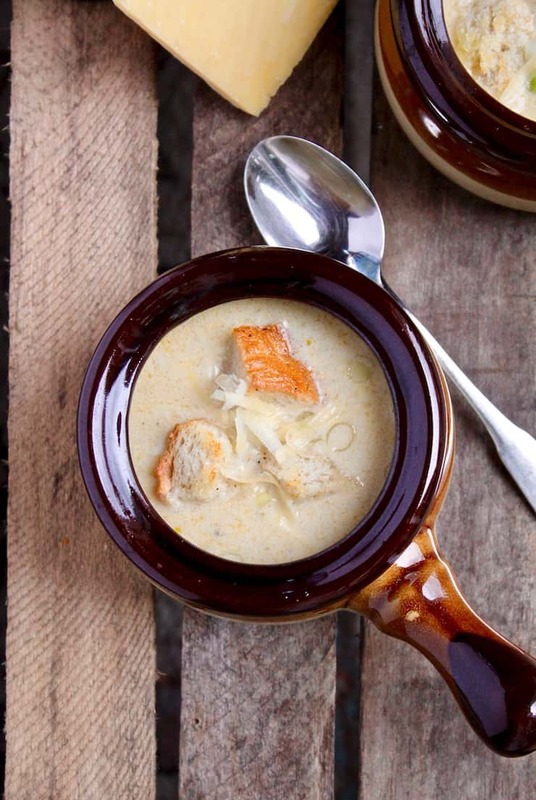 Irish beer and Irish cheese are the basis of this delicious cold-weather soup and St. Patrick's Day favorite. In large enameled cast iron stock pot, heat 2 tablespoons butter (or bacon grease) over medium heat. Add onion, celery and bay leaf and sauté about 5 minutes. Add the garlic, salt, black pepper and cayenne and cook 1-2 more minutes. Add the butter and stir until melted. Sprinkle the flour over the mixture and stir and cook 1 more minute. With a wooden spoon or flat whisk, slowly stir in the stock, then the beer, then the milk to combine. Lastly, add the cheese slowly, stirring to combine. Increase the heat to medium-high, continue stirring to almost a boil. Reduce heat back down to medium, cook and stir frequently until cheese is mixed in well and melted, about 20 minutes. Remove bay leaf and stir in mustard and Worcestershire; taste for salt. Serve garnished with scallions, chives, croutons and/or crumbled bacon, in a bread bowl, if desired. 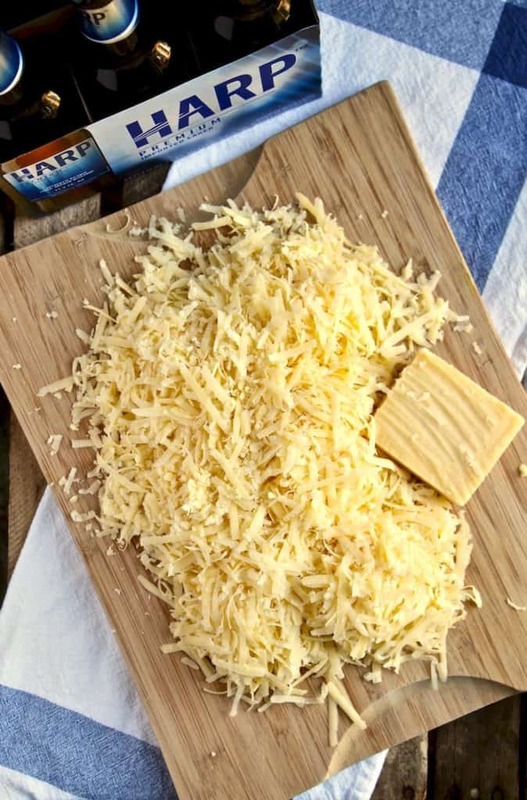 Irish Dubliner cheese is sweet, nutty, grainy and sharp. Any sharp white cheddar will work. Using a food processor will get the onion and celery finely chopped, almost mushy, which is what you want for this soup. Roughly chop the onion and celery first, in order to get an even dice in the processor. I am going to make this for an Irish carry in. Do you think it would work well in the crock pot to warm it if I make it on the stovetop the night before? Yes, I think so, should be fine.